« 4 Bottle Robot Race – Anyone can enter ! We've just received our first shipment of VEXplorer kits, and we couldn't resist cracking one open to peer at all the goodies inside. Here's a quick look at what we found. Click on any picture to see a larger version. The packaging is pretty slick. The box is a big, shiny, and does a good job of showing off the goods. It's a commercial for itself. If you saw this in Wal Mart, you'd buy it. Well, you'd buy it if you were the kind of unscrupulous individual who thinks shopping at Wal Mart is a good idea. You're not unscrupulous, are you? The major mechanical modules come preassembled. For those of us with painfully short attention spans, this is very good news. Revell claims that you can put everything together and get it running in an hour. Having seen the preassembled arm, gripper, and drive modules; this figure sounds much more realistic. Everything looks very solid and well-built, as well. The gripper looks good. The gripping surface is curved and coated in a rubbery substance, for maximum grabbing potential. The gripper has some springs built into it, to lessen strain on the motor when it clamps down on something. The apparatus on the left is the shoulder for the arm. Everything is driven by DC gear motors. Structural components: some assembly required. We've got chassis frame pieces, brackets, nuts, bolts, a mounting panel, a crescent wrench, two allen wrenches, and (of course) zip ties! Here, following the picture in a clockwise fashion, are the controller, receiver, battery pack, wireless camera, camera receiver, and A/V cables for the camera receiver. The controller is a bit large, but comfortable to hold. Remember the original XBox controllers? The morbidly obese ones that had all that wasted real estate? This controller is kind of like that, except there are just two control sticks and four shoulder buttons. I was hoping to see some servo ports on the receiver, but instead you get 6 DC motor channels and two auxiliary ports. Initially, the kit was going to have servo support (all of the concept art had 3-wire cables leading to the actuators), but I'm guessing this was removed to keep the price down. The battery holder takes 6 AA batteries, but it has a standard Tamaya connector, so it could easily be replaced by a higher capacity 7.2V R/C battery pack. If VEX was going to pick one thing to not make proprietary, I'm glad it was the battery. The camera has a built-in microphone, which is pretty cool. It takes power from the main VEX receiver unit, but otherwise the camera/receiver system stands alone, so you could potentially incorporate it into any teleoperation or surveillance project. The camera receiver is powered by an AC adapter and plugs directly into a TV, video card, or anything that has a composite video RCA input. A kit can have fancy electronics, precision motors, and sprockets forged of pure platinum; but if the manual is garbage, it could be a frustrating disaster. Now, the VEXplorer kit may not have any platinum sprockets, but it does have a damn fine manual. 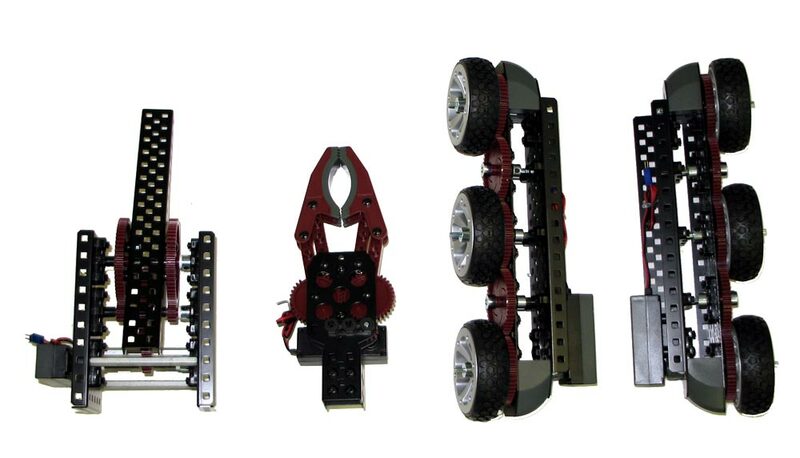 You'll find big, clear pictures of the assemblies and the parts needed to complete each step. 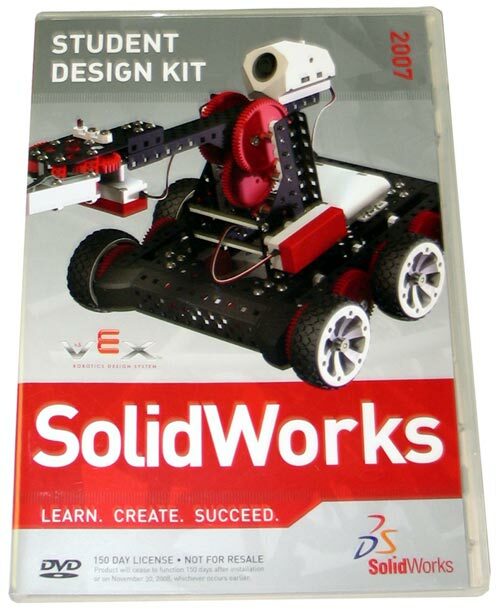 VEXplorer also comes with a SolidWorks "student design kit." Basically, this means you get a copy of SolidWorks and a limited free licence. 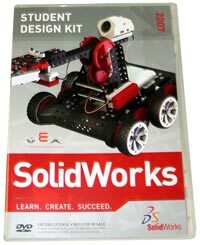 SolidWorks is a very powerful design tool, and knowing how to use it is a valuable skill for those who are moving into professional design fields. Not too shabby! 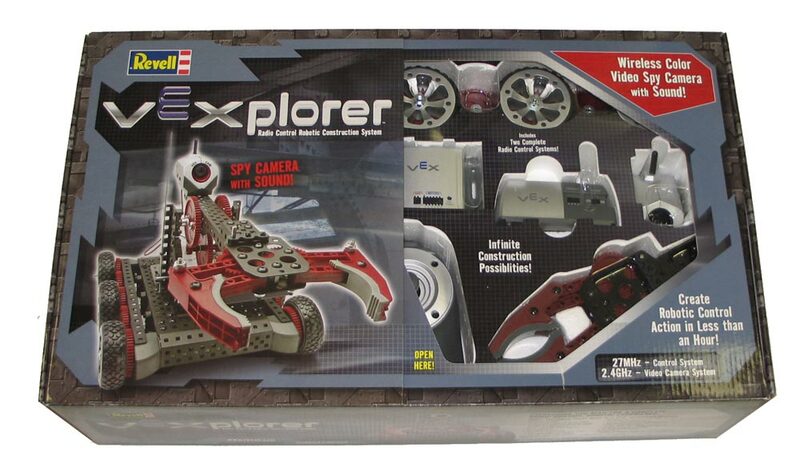 To purchase this kit, you canfollow this link to our VEXplorer product page. This entry was posted on Thursday, August 30th, 2007 at 4:47 pm	and is filed under Announcements, Front Page News, Fun Stuff, New Kits / Products, Product Spotlight. You can follow any responses to this entry through the RSS 2.0 feed. You can leave a response, or trackback from your own site. En Colombia donde puedo encontarlo? Also, are the clutch assemblys strong? I’ve gone through quite a few of the older ones. > En Colombia donde puedo encontarlo? Podemos enviarlo dondequiera en el mundo. Â¡Si lo deseas, puedes pedirlo de nosotros! I’d love to make some videos, but we don’t have a spare kit right now. > Also, are the clutch assemblys strong? Iâ€™ve gone through quite a few of the older ones. Don’t know. Haven’t tried to break one yet. does it go a resonable speed? is the claw pretty strong? how much do u think th claw and arm assemblie can lift 5lbs? 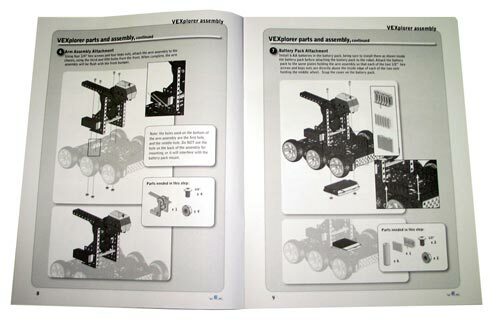 I could go on with all sorts of details about the VEXplorer, but all I would be doing would be re-iterating everything that I read in Robot Magazine’s latest issue (Winter 07, has i-SOBOT on cover). I highly suggest picking this issue up because Grant Imahara (yes, FIRST Robotics and Mythbusters Grant!) 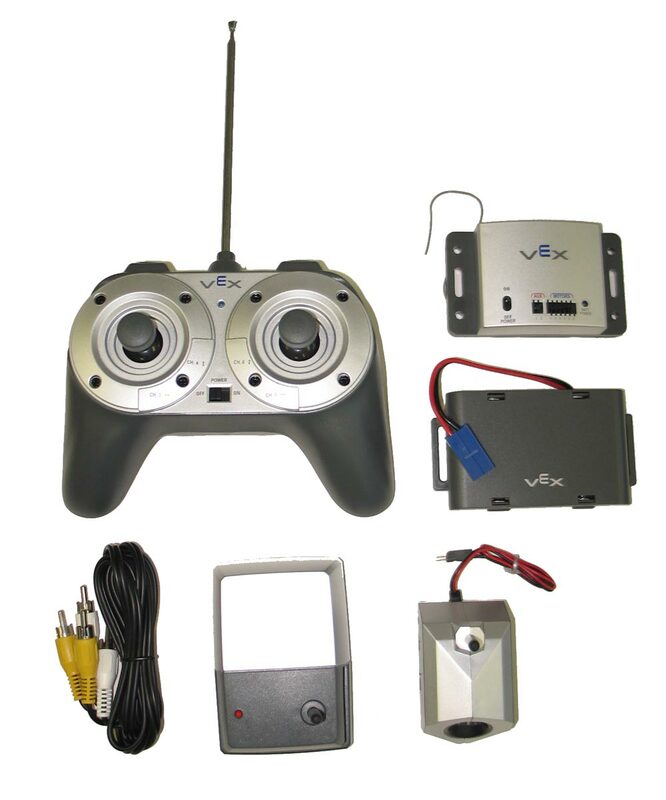 has put together an excellent review of the VEXplorer. Any question you have about this robot can probably be answered in this article! I know at least all of my questions were answered. Don’t sweat it, man. The directions are clear and detailed. If you can use a screwdriver, you can put this kit together. Have fun! Hey, just bought a vexplorer; It’s in the mail now! I was wondering: what is the controller’s range?